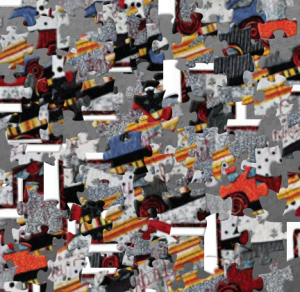 This week’s puzzle spotlights a quiltmaker who was interviewed for the Quilters’ S.O.S. – Save Our Stories oral history project on March 7, 2008. This interview is one of the first 20 interviews added to the new QSOS website to launch our QSOS 20th anniversary year. The Quilt Alliance is in the process of a major update for the project that will include searchable audio recordings and transcript, interview summaries and keywords and photos. The entire collection is still viewable on the QA website here, but this new site, when completed (hopefully by early 2020), will make the collection of more than 1,200 QSOS interviews with quiltmakers far more accessible online. 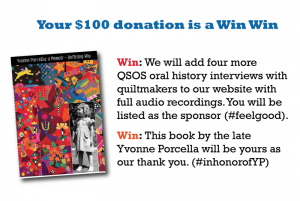 Visit the new QSOS site with sample interviews here and consider making a $25 donation to sponsor an interview! Interviewee: Like any exhibit, one of the most interesting parts I think of doing a quilt show is to stand next to other people and hear their comments, especially if they don’t realize that you made the quilt, whether it is yours or someone else’s, because you really learn the inside of what quilters are thinking. I have often thought that there should be a tape recorder in the back of quilts and then play it later. Interviewer:Tell me about your interest in quiltmaking. Interviewee: Oh, Karen it goes back to the Stone Ages now. My quilting started in New Orleans of all places, although as a little girl I have always done patchwork. I was gifted with a lot of energy and I think to keep me out of my mother’s hair she would give me needle and thread and so I’ve always done stitching. I did the doll clothes thing. I guess I was always with a needle and thread going through cloth. It just always intrigued me, and I really didn’t have any question about what I would do when I went to college. Interviewer: How do you want to be remembered? Interviewee: Oh my, I told my group in Wilkesboro, someone asked me that or I guess it came up in the course of my conversation, and I said I guess I will always beremembered for the full proof knot, it was one of the things I taught on one of the very first shows, my full proof knot for quilting and dog ears. I don’t think anyone has come up with, when you cut off the extension of a triangle, those little things fall off and I have always called them dog ears, but that is kind of in jest, but I think what I would love to be remembered for is probably the comment that people say when they saw me doing patchwork on TV is like, well I can do that, if she can do that, I can do that. I guess that is what I would like to be remembered, that I’m really basically an ordinary quilter that was able to transcribe the fun, the excitement of doing it through a television screen and then many people can say, well I can do that. I guess that is what Iwould like to be remembered for. You are getting me all very emotional about this Karen. [laughs.] I guess the bottom line is that for many of us quilting is an emotional thing. I guess that is the bottom line.